The future of forests looks dreary in the face of a warming climate, but scientists are exploring the relationship between soil microbes and the ability of trees to move to higher altitudes, a key component of their survival. With the rate of ice melting and sea level rise happening right now, we're already due for a fair amount of global warming. While treaties and protocols may reduce greenhouse gasses in the future, it will not be enough to stop the damage already done and in progress. Global climate is projected to continue to change over this century and beyond. The magnitude of climate change beyond the next few decades depends primarily on the amount of heat-trapping [gasses] emitted globally, and how sensitive the Earth's climate is to those emissions. Catastrophe or livable climate change and the current delay in addressing the reduction of greenhouse gasses will impact the inhabitants of this planet long after our lifetimes. And many of those in inhabitants are trees — organisms vital to the survival of life on Earth and without legs to move about its surface. Trees and other plants are sitting ducks as the climate heats around them, making their environments unlivable. They must move habitats to survive, but how? Warming climates impact the health of organisms adapted to living in cooler ecosystems. In what we can only describe as "adapt or perish," most things living on this earth have limited options for surviving a quickly heating world. Corals, algae, fish, birds, insects, and animals suffer illness and death if they cannot expand their range or physiologically adapt to higher temperatures. But trees just can't move very fast. Unable to move upward to higher elevations with cooler temperatures, some trees are already dying. A study that looked at plants in the Northern Andes and northwestern Columbia found the range of highland trees, or trees at higher elevations in tropical forests, was declining and their numbers were dropping. A new study, published in the journal Nature Ecology and Evolution, took a closer look — a microscopic look — at the complicated relationships that take place between trees and bacteria, fungi, and other microorganisms that support tree health under the ground. Using field observation, as well as soil, chemical, and microbial analysis, scientists sought to better understand the importance and function of plant-soil feedback (PSF) between trees and the microbes that live in their root zone, called their microbiota. 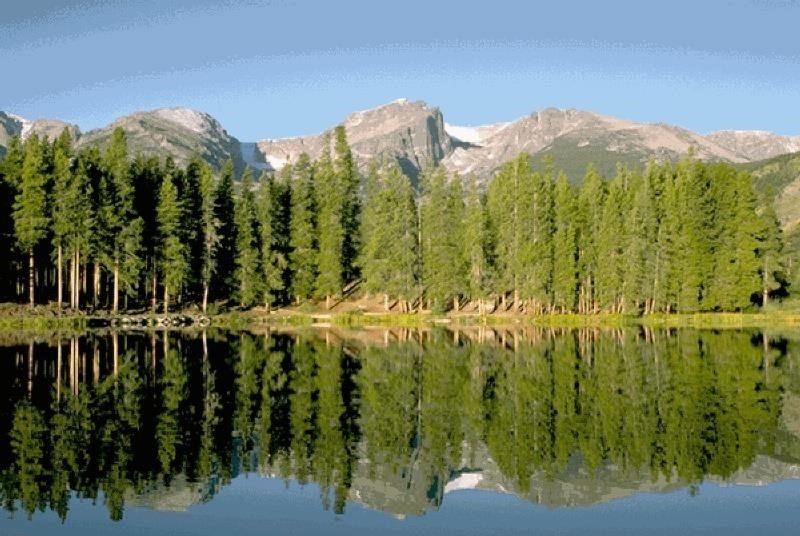 Overall, the research team was evaluating consequences of warmer temperatures on tree species native to the American Rocky Mountains. In this case, Populus angustifolia, the common narrowleaf cottonwood tree. PSF is pretty much what you might imagine, plus some. The feedback is the process by which plants, like trees, alter or adjust the soil in which they live. There are non-living factors and chemicals that impact the growth of trees that they cannot influence, like temperature, nitrogen, carbon, humidity, and water availability. But there are living factors that plants, like trees, influence and interact with, including soil-borne bacteria, fungi, and soil pathogens, among others. As with humans, there are two types of feedback, positive and negative. These intimately associated communications influence how and where the plant will live. With positive feedback, the plant and the soil microbiome cooperate to enable the plant to live in its current range and soil. With negative feedback, the plant withdraws from the conversation due, perhaps, to inhospitable conditions in the soil like dryness or overcrowding that cause it to send roots and shoots a different direction. The soil microbiome is the landscape in which the tree lives. Not at all sterile, the soil is alive with fungi, bacteria, and microorganisms finely attuned to the location, elevation, and particular conditions, plants, and nutrition available in any one geographic area. The microbiome and the PSF cycle are altered when a condition, like temperature or rainfall, changes. In this study, scientists sampled seven different populations of the cottonwood tree, from elevations ranging from 980 meters to 2,900 meters, across the Rocky Mountain West. Back in Tennessee, branch tip samples were used to create cuttings of the trees, which sprouted roots when treated with rooting hormone and placed in soil. The young trees were potted up and grown for 14 months, whereupon they were randomly bare-root shifted into pots with live or unconditioned soil. The live soil contained the bacterial families associated with their home territories, and the unconditioned soil did not harbor microbial activity. Soil samples collected from elevations and locations where the trees had been sampled were analyzed for chemical and microbial components using DNA extraction and other analysis. For these trees, the most abundant classes of bacteria in their native soils included Actinobacteria, Alphaproteobacteria, Betaproteobacteria, Gammaproteobacteria, and Synergistia. These are common classes of soil bacteria. Trees planted in soil closely approximating their natural soil microbiome created a "significant positive feedback effect" for the cottonwood tree. Trees in this bacteria-conditioned soil grew 24% larger than trees grown in soil that did not have resident bacterial communities from its native range. In terms of conditioning, greater abundance of the bacterial class Betaproteobacteria correlated with more biomass, like top growth and root structure, across elevations. Positive PSF could block upward slope movement of lower elevation trees as the climate warms. Remember, positive feedback means the trees are actively engaging in bioactive feedback with microbial communities. In contrast, higher elevation trees growing in conditioned soil from the upper edge of the range experienced negative PSF, potentially accelerating their movement upslope. Negative feedback indicates disengagement between the tree and supportive microbial interaction. The majority of evidence to date shows that negative PSF allow plant migrations past range boundaries, while positive feedbacks support plant persistence in harsher environments. If applicable to other tree populations, this research highlights the importance of understanding the interaction between trees and the microbes at their feet. While higher numbers of beneficial bacterial communities offer positive support for trees to shelter in place, pathogens (and negative feedback) may signal overcrowding or a lack of nutrients needed for growth — encouraging seedlings to expand beyond their range. With climate warming, relocating neighborhoods could spell survival. This indicates that we need to work with the trees near the bottom of the mountain because they are the ones that will feel the most stress from warming temperatures. So we have to figure out a way to coax them to move up. While there are many known and as-yet-unknown factors that will bear on the survival and migration of tree species in a warming climate, these findings provide a possible option for science to evaluate which trees can be encouraged to pack up and move when the going gets warm.